Aaron and I first met when he was in 8th grade and I was a sophomore in high school. Yes, I'm a cougar, but to be fair- we're two years apart in school but only a year and a few months apart in age. Anyways, I didn't even know who he was, as I was way too cool to be thinking about dating younger middle school boys. We met at church, and he swears up and down that the first time he saw me I was up on stage singing and his mom leaned over to him and asked, "What's wrong with that girl?". His response? "Absolutely nothing." The "man-van plus Kelsie" on a church trip. The majority of our early pictures together look something like this. Aaron and I both in the same place, but nowhere near "together". 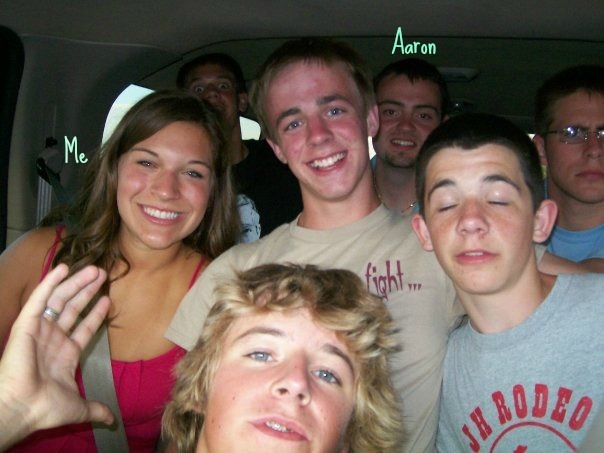 Aaron was younger and dating someone else, so I never even thought about being attracted to him. He was a sweet guy with a great voice and a love of strawberry lemonade, but I wouldn't say I knew him well. I was off at Mizzou except for the summer, and he was a high schooler. For my grad party, I asked if anyone had a Mizzou flag that I could borrow. Aaron said he did, then bought one and let me keep it as a gift. (Clever, huh?) I hung it in my classroom at school. Aaron started texting me every now and then, just to ask about school. I didn't know this yet, but he had taken a year off of dating after his last break up, and the very day that he had circled on the calendar to start dating again, I had come back into his life. His patient pursuit had begun. 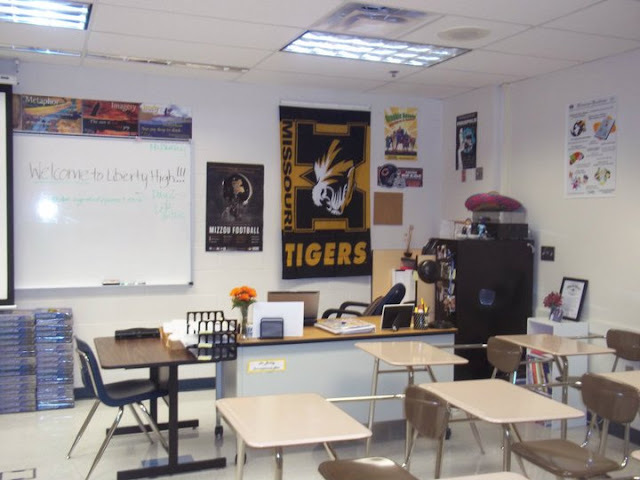 My first classroom, complete with the Mizzou flag Aaron gave me. When the winter of 2011 rolled around, I was halfway through my first year of teaching, and was also coaching basketball. 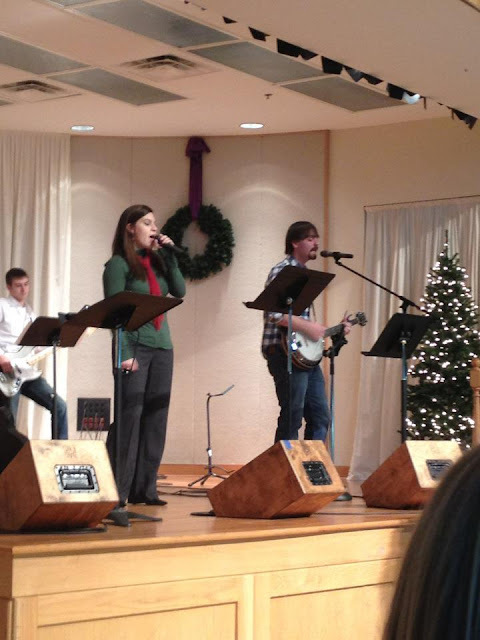 Aaron was home on break from college, and we lead worship again. He showed up to my basketball games, and I started to figure out that he liked me. We went to a game at Liberty North with a married couple, which was a bad idea because we weren't even dating. I friend-zoned Aaron. Thankfully, I didn't scare him off. Then one week, Aaron received an anonymous letter from someone at our church. The letter told Aaron to take me out on a date, and $50 was enclosed to help him pay for it (you can't make this stuff up!). Aaron told me about it, I laughed, and he said that he would put it into his bank account and maybe take me out someday if I'd let him. At this point, I was scared to lose a friend, and didn't know what I was feeling. But he'd get his chance. Leading worship together in Aaron's pre-haircut days. To everyone else, Aaron and I were a no-brainer. People saw us sharing a water bottle before worship and assumed we were dating. My younger brother asked my mom when we were going to get married, to which she replied, "They should probably date first." My dad even said that he wouldn't be upset if I went to a different church to meet a guy, unless I was going to marry that "Aaron Kleinmeyer guy". Everyone knew him, and everyone loved him. (And with a heart as big as his, how could you not?) Aaron conveniently started to come home more for church, and he even found his way to my parents' house for lunch with my family. Things really started progressing through February and March. For the first time ever, I knew what it felt like to be truly pursued (and ladies, you should always be pursued). No longer was I wasting time decoding text messages from prospects or dreaming up reasons to talk to a guy- Aaron was intentional about texting me, asking questions, and being real. Our phone conversations about church and worship turned into hour long convos about everything while I walked on the treadmill in our basement. A simple question about my day turned into a two hour exchange about our life goals and dreams (separate, though aligned). Safe to say, the Lord was doing a work in my heart as I saw a man that I looked forward to speaking to and being vulnerable with. One who truly cared about me from hours away in Columbia. One I grew to long to talk to and be with. 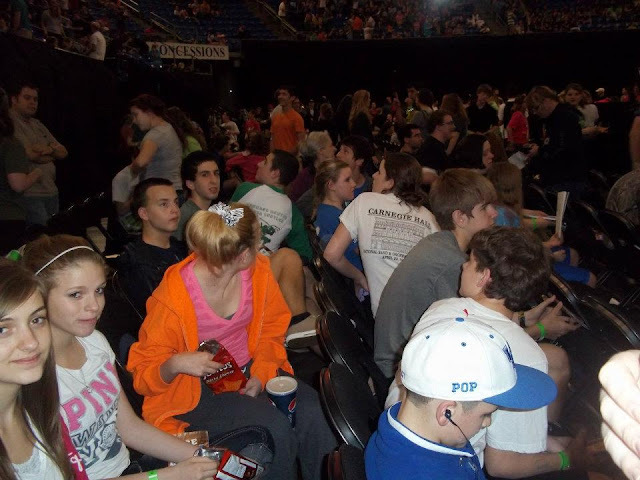 A Group of our Kiddos at the Dare to Share Conference 2012. That St. Patrick's day, Aaron and I were both attending the Dare to Share Conference as leaders for our church. The trip was taking place in St. Louis, so I was coming from KC after school, and Aaron was going to be picked up in Columbia. I knew this was a make or break it thing. We had been talking so much that this was either going to be incredibly awkward or incredibly perfect. As we both sat in a leader meeting together, I had my arms folded. Aaron did too, and when his hand accidentally brushed the back of my arm, tingles shot down my spine. I knew that I could be, and was, attracted to Aaron. On the way home, I may have gotten pulled over in Columbia after we dropped Aaron off because I was so caught up in emotion that I forgot to turn on the mini-van's lights. Oops. Needless to say, I woke up the entire van of sleeping kiddos. The secret was out. I was falling for Aaron. I cancelled a triple date I had been set up on a month before, and Aaron asked to take me on a date in KC over his spring break so that he could officially ask me out in person. I agreed. Our first date was March 28, 2012. It was everything a girl could've dream of. We grabbed dinner at Bo Lings, bought our journal, and slow danced in the rain before heading to the midnight premiere of Hunger Games. The next morning, I took Aaron to the airport so he could fly to Texas with his grandma to get Tori (the car we recently said goodbye to). We started our long distance relationship of journal writing, Skype dates, and talking on the phone. I loved falling in love with someone from a distance- hearing his voice made me melt, nothing was based on the physical, and it was always so exciting to actually see each other in person. 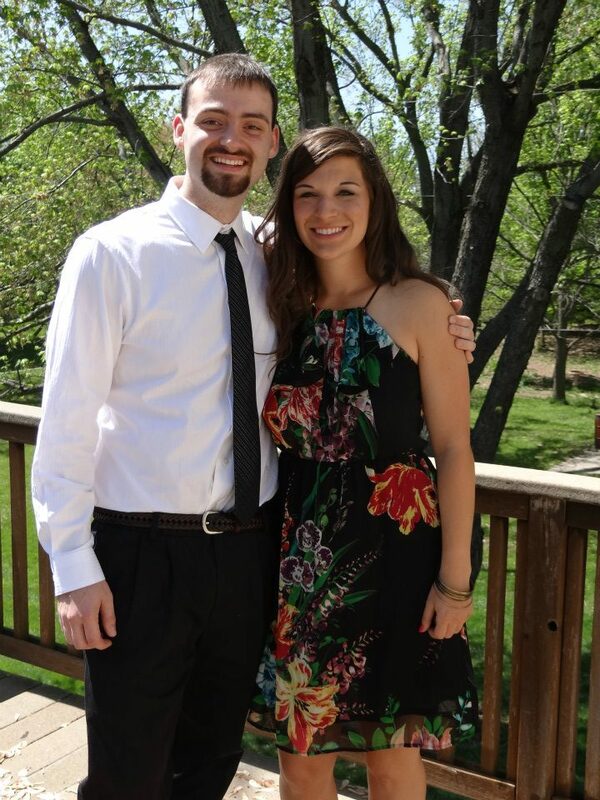 Our first boyfriend/girlfriend picture, on Easter. Pretty much right away, I knew we were going to get married. We'd been very intentional about the start of our relationship, and wouldn't have been dating if we couldn't see ourselves getting married. That April, my childhood neighbor was getting hitched and I was going to be a bridesmaid and sing in her wedding. 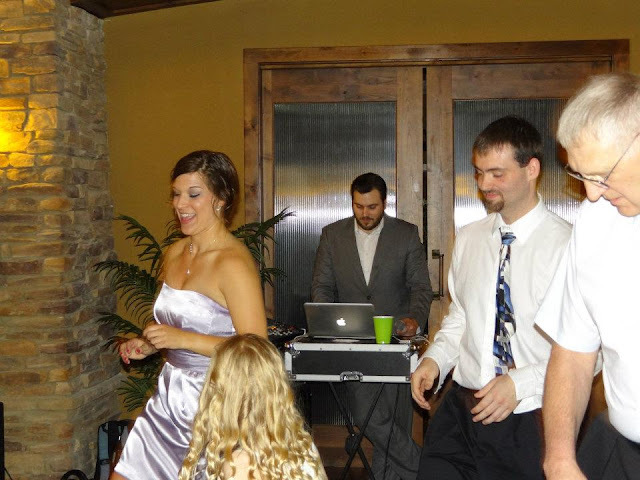 I was able to recruit Aaron to help sing, partly because I think we harmonize well and partly because I wanted a reason for him to come to the wedding. (And who doesn't love a guy who can sing?). At the reception, we slow danced together, and for the first time, I knew that this was what it felt like to be in love. For the first time, the guy I was dancing with couldn't take his eyes away from mine. For the first time, I felt like I was right where I was supposed to be. That night, people asked me when we were going to get married. I told them we'd only been dating for a month. But when you know, you know. The night I knew, without a doubt, that I would marry Aaron. The next eight months were a whirlwind as Aaron moved to his grandma's for the summer, and then to Independence to student teach. We found out what dating in the same city was like. Being only 45 minutes away was way better, but I still hated every goodbye, and dreamed of a time when it would be good night instead. As each month ticked by, Aaron stuck around, and I stopped worrying that I was going to mess things up like I'd always seemed to before. That November, we made it through my grandma's death and funeral, and Aaron was my shoulder to cry on. Little did I know, he'd already planned a big surprise engagement with my best friends, asked for the blessing, bought a ring, and kept my grandma in the loop before she passed away. But how Aaron popped the question is a story for another day. For now, just know that it was perfect. 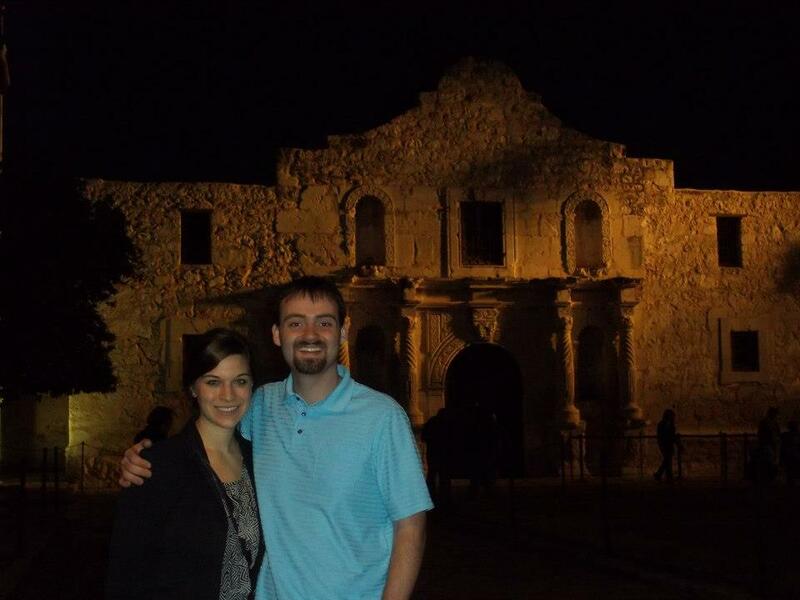 Visiting the Alamo on Aaron's birthday, while on a Non-Stop YL trip, just a few days before he proposed. Every day I am so thankful for the amazing way that the Lord brought us together. I recognize that He had his hand in our story from the beginning, and only when I truly relied on and found my meaning in Him, was I able to open my heart up for Aaron. I'm so thankful that Aaron was patient and persistent with me, that he found me to be someone worth fighting for. I'm thankful that I took a chance on an amazing man who is truly my best friend, my partner in crime, and my biggest fan. All of the waiting, the heartache, and the loneliness that I felt through college and beyond was worth it. Our marriage is the best adventure I've ever been on. I've heard it said before: "Run as hard as you can towards the Lord, and then look around to see who's there with you." That's our story. Aaron and I both were running towards the Lord, while pursuing kids and leading others in worship. Then we looked around, found each other, and realized that we were in it together. To this day, we're still in it together. We fight together in the trenches for our YoungLife kids to know Jesus. Few things in life bring me more joy than praising God together in song, or feeling my heart melt as I watch Aaron love kids well. I am so blessed to have a godly man who leads me and loves me with more grace than I'll ever deserve. He'll say I'm a catch, but he's wrong. He's the catch. And I'm so thankful that he chose me, and continues to do so daily, despite my stubbornness and imperfection. It's the most beautiful picture of loving me like Jesus does. He liked it, so he put it a ring on it. And the rest, my friends, is history. Every love story is beautiful, but ours is my favorite. I can't wait to see the rest of it unfold. I'm linking up with Twinkly Tuesday, Purposeful Faith, Teaching What is Good, Testimony Tuesday, Intentionally Pursuing, The Painted Teacup, Messy Marriage, Sweet Little Ones, Amy Schlichter, Organized 31, Bliss and Faith, Welcome Home Wednesday, Let's Be Friends Blog Hop, and The Modest Mom Blog. Thanks so much, Cristina! We are very blessed. What a beautiful story! We will also be married 2 years this month! I loved reading your story and I am looking forward to reading about the proposal in a future post! Thanks for joining the Link-It To Me Link Party! I hope you will party with us again next week! Thanks, Chantal! Looks like we were both tying the knot in a great month :) I've got a proposal post coming your way in the next few days. Be looking for it :) Thanks for having me, as always! This is the best.story.ever. SO SO SO cute and so amazingly God ordained at every corner! Did you guys ever figure out who sent him the envelope with money in it?? You are way too kind, Sarah! (although I do think it's pretty awesome!) Isn't God so good? So we have a few guesses about the envelope, but when we asked one lady about it she wouldn't really tell us either way. So we don't know! Isn't that so fun. Everyday I am so thankful for Aaron's pursuit, and the way that it gives me just a glimpse of the way Jesus continuously pursues me! Thanks for stopping by! What a precious beautiful story of your growing love, and God pulling you toward one another--as you ran toward the Lord! "That's our story. Aaron and I both were running towards the Lord" I absolutely love the person who gave Aaron $50 - What a fabulous person! I was drawn to your story at #raralinkup since it's our anniversary this week, and my post is also on how I met my husband! (http://www.holyvacationqueen.com/the-treasures-of-marriage-and-intimacy/) I'm much older than you, and we didn't know the Lord back then, but God's was behind the scenes working away at our hearts! And my husband is also younger than me! Thank you, Crystal! That is one of my very favorite parts of our story, and something I encourage all younger girls in. Thanks for having me! Thanks Diana! It still has that effect on me too :) God is so good! Thank you so much! I love it as well, it's exactly what I needed for God to remind me of His unfailing love! 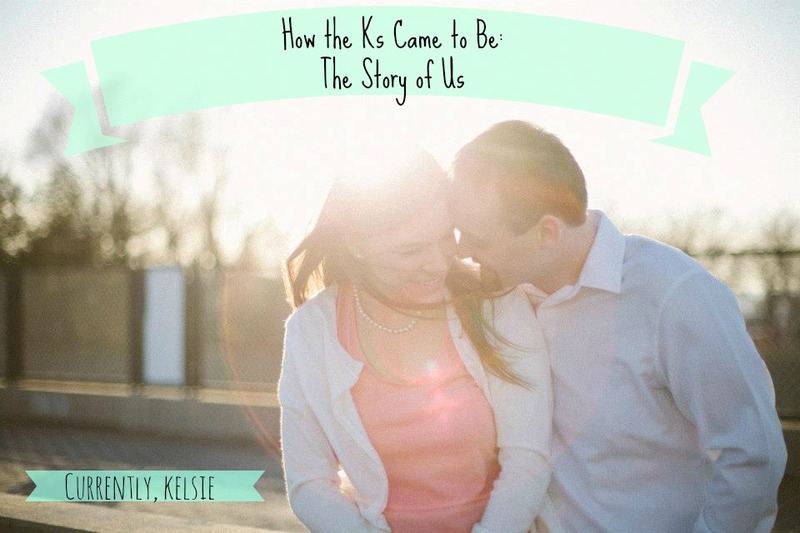 What a beautiful story, Kelsie! The timing and how things unfolded cannot be more perfect, truly God's masterpiece 💜 All the best to you and Aaron! Thank you, Reg! I totally agree- God has a masterful way of making things work at exactly the right time. Thanks so much for your well wishes! Hugs to you. Such a sweet story! I love hearing love stories and it sounds like you two are perfect for each other. This is such a beautiful story, with God at the center of everything--which just makes it better. I love it! Thank you, LaurenJane! You are so right!! I love your story! My boyfriend and I have been together since we were 15, and we're now almost 21. I have loved really growing up with him! Thanks so much, Emma! That's so fun! Such a cute story, happy 2nd anniversary to you guys! What a sweet story! I met my hubby in high school. It is amazing how we cross paths but don't realize the chemistry until later! Thanks so much, Ashley! You're so right! Man your guy is PERSISTENT! Lucky for the both of you, lol, he knew what he wanted and he didn't rest until he had it. You've got to respect that, and also your obvious affection for each other. Oh my goodness, I absolutely LOVED reading this!!!!!!!!!!!! God is SO good when He directs our love stories!!! Did you ever find out who left the $50 for your date????????? Aww, you guys have a beautiful story! I love that you guys have known each other from a very young age! I met my husband when I'd just turned 17, but because of our age gap, he was already 24, so I missed out on seeing what he was like when he was young. I have tears in my eyes. That was beautiful! And you are so right with one thing: when you know, you know. :) My boyfriend and I have been together for nearly 3 years and I thank God for him constantly. Oh my word, I LOVE this love story! So precious...thank you for sharing it at your very own party! (Stopping by from there, by the way!) My husband and I also met at church. I, too, sang that morning. Afterwards, he said, "I enjoyed your song, Elizabeth." I said, "Thank you," and that was it. We got into our respective parents' vans and told them, "That's the person I'm going to marry." Anniversary #21 just happened. 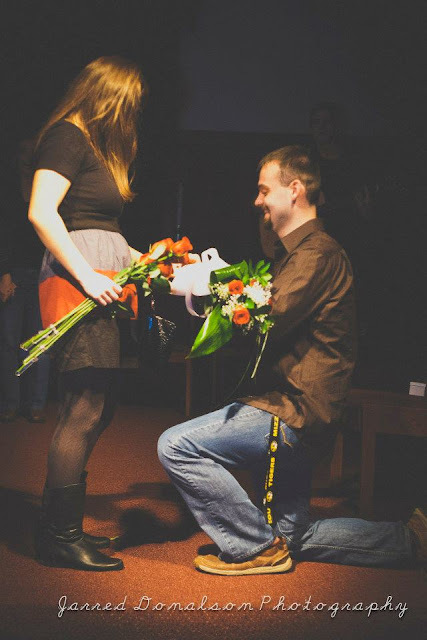 :) Congratulations to you two Ks...the best is yet to come! A beautiful story Kelsie, I'm so happy for you and wish you many many more anniversaries to come! Aw, what a sweet, sweet story! I love his response when his mom asked him about you: "absolutely nothing", and I love that you both go so far back! There is a lot of comfort in knowing each other's stories so well. This was such a wonderful story to read on Valentine's Day!! I have been following along with your pregnancy journey, and I can't wait to see pics of baby!! I, also, applied for a rewards credit card after reading all your posts on traveling via rewards cards. I really enjoy reading your blog! Just wanted you to know! This is seriously so cute :) I love that your relationship was founded in the church. It makes for such a special and beautiful story. Happy Anniversary to both you and Aaron! What a sweet story! I always love hearing about how people meet and start dating, especially when things get off to an unclear start. :) What I really appreciate your story is how the Lord really is front and center in the whole thing -- and I can tell that's still true of your marriage. What a beautiful love story! I love how the Lord kept bringing you closer together! God is great! Aww this is so sweet! What a perfect story.